The Lark Sailing Charters - Barrett Adventures the Real Jamaican Adventures. The most common charter is a week along the north coast of Jamaica, from Port Antonio to Negril. we have a driver meet us to take you out for a morning tour every day. It is a lot of fun to see all that Jamaica has to offer. It is a beautiful country and there is lots to see and do. Unfortunately, most sailors never get past the closest bar in the harbour they have docked at for the night. We make sure you get to explore the real Jamaica and sail to your next destination in the afternoon. It is a very convenient way to experience Jamaica. You don't have to pack up every morning to move to the next B & B. Your boat moves with you. 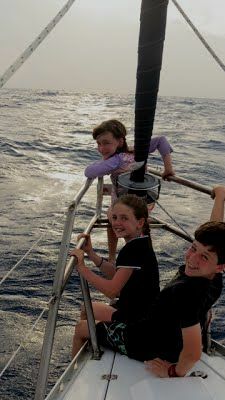 Here are the Jones kids from Australia who did a week long charter. They are having a great time watching for dolphins. Loxley fixing dinner. We can eat in or go on shore. This cruise ended in Negril where we definitely had to try the great restaurants on the beach before going back to Kingston by car.